My name is Luz, and I’m from Mexico. 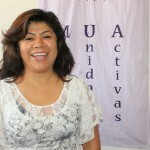 I have been coming to Mujeres Unidas y Activas since 2002. I started coming to MUA because I wanted to help and give my support to other women but I realized that I was the one that needed help. I like the friendships I have made and the respect I am given at MUA. Here you have a place for yourself. I have learned that I am a leader and that I can continue learning new things. I’ve learned to recognized the great privilege it is to be a woman. My hope for my future at MUA is to never stop learning.